InSight set down on Mars at around noon Pacific (3 p.m. Eastern) on Nov. 26, 2018. The lander will plunge through the thin Martian atmosphere, heatshield first, and use a parachute to slow down. Then, it will fire its retro rockets to slowly descend to the surface of Mars, and land on the smooth plains of Elysium Planitia. 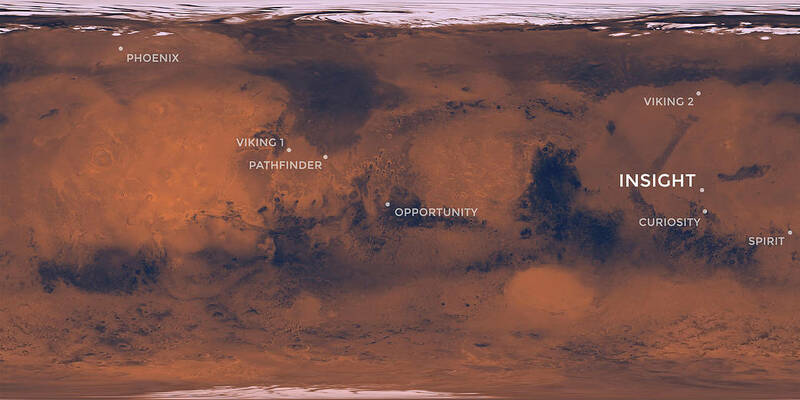 Why is InSight Landing at Elysium Planitia? InSight's goal is to study the interior of Mars and take the planet's vital signs, its pulse, and temperature. To look deep into Mars, the lander must be at a place where it can stay still and quiet for its entire mission. That's why scientists chose Elysium Planitia as InSight's home. The rocket that launched InSight also launched a separate NASA technology experiment: two mini-spacecraft called Mars Cube One, or MarCO. These briefcase-sized CubeSats fly on their own path to Mars behind InSight. Their goal is to test new miniaturized deep space communication equipment and, if the MarCOs make it toMars, may relay back InSight data as it enters the Martian atmosphere and lands. This is the first test of miniaturized CubeSattechnologyatanotherplanet, which researchers hope can offer new capabilities to future missions. If successful,theMarCOscouldrepresenta new kind of communication capability to Earth. InSight’s success is independent of its CubeSattag-alongs.